Time for a spotlight, don't you think too? I love the stitched together metal plates - this idea is sooo brilliant (and if allowed to I might borrow it some time ;). Thank you for the awesome inspiration, Amy! Please, feel free to take the badge for your site. To get to our current challenge, please, click here or click the image on top of the side bar. Thank you! 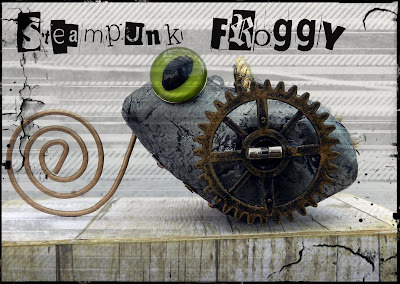 Hello and servus, dear Steampunk friends and crafters! 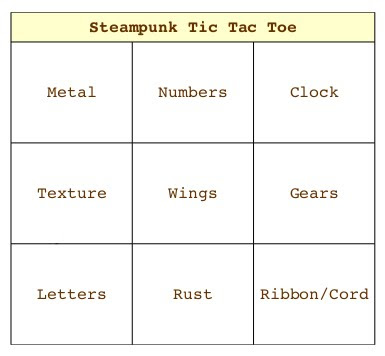 Time to announce the prize for this month's challenge and to remind you that there are still two more weeks left for entering our Steampunk Tic Tac Toe challenge and thus become eligible for our randomly drawn prize winner. To win these all you have to do is create a project for our TicTacToe Steampunk challenge and enter it - random.org will pick the winner from the entries then about a week after the challenge has ended on October 31st. Oooops, sorry I am a bit late today, but things have been a bit hectic during the last days as I slipped in the shower two days ago and almost broke my ribs - seems I was lucky "just" to have some heavy bruises on my left side (moving is a bit hurtful and raising my left arm is not a good idea at the moment) and the x-ray that had to be done didn't show any severe injuries.... *phew! So I am here now (at last!!) to bring to you the Top3 of our september challenge "Dolls 'n Robots" and the randomly drawn prize winner of the 10 Euro voucher for Irishteddy's online store. The entries were - as usual - absolutely fantastically thought-outside-the-box ones and we loved them all! We really appreciate the amount of creativity and thought you always put into the makes you enter with our challenges! Thank you so much! Congrats, ladies! Soooo very well done! Please, feel free to grab the Top3 badge for display on your blogs! Please, contact me (see link at the sidebar) for further details! 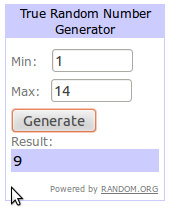 (I always add the numbers of the 3D collection's entries to the numbers of the 2D collection before using random.org, so #9 over at the 3D collection is actually the 3D entry #6 - just in case any of you wondered how this works). Our new challenge for october has already started - this month we are playing Steampunk Tic Tac Toe! We would love you to join us and have fun! So all you have to do is choose three ingredients from one straight line of the diagram (horizontally, vertically or diagonally) and use them for your Steampunk creations. As usual we provide you with two separate collections for the 2D and 3D projects (so, please, pay attention to enter your projects to the correct inlinkz collection). We were once again blown away by your entries for our last challenge, all of them being so creative and unique!!! Thank you so much for playing with us - we are so happy to have you so constantly with us! You really make this spot so special! The Top3 from the september challenge will be announced on saturday as will the randomly drawn prize winner of the 10 Euro voucher for Irishteddy's store! So, please, come back next saturday to check if you are one of the chosen. As usual we have an awesomely talented guest with us and I am so happy to introduce Tina from Tina's Craftworld to you! If you want to be with us as our Guest Designer (which we would LOVE you to) just add GD to your name when entering our challenge via the inlinkz-tool. We will contact you for further details then. Isn't it amazing? Tina chose "Texture - Wings - Gears" for her adorably altered handbag. I just love the colours, all the steampunk embellishments and that winged cross!!! An utterly whimsy and artsy make and sooo inspiring! If you visit her blog you will find a How To for this terrific project! Today I am pleased and honored to be the guest designer for the month of October on the challenge blog Sandee & amelie's Steampunk. Hello my name is Tina Suitella I'm a single mom and I live near Amsterdam. 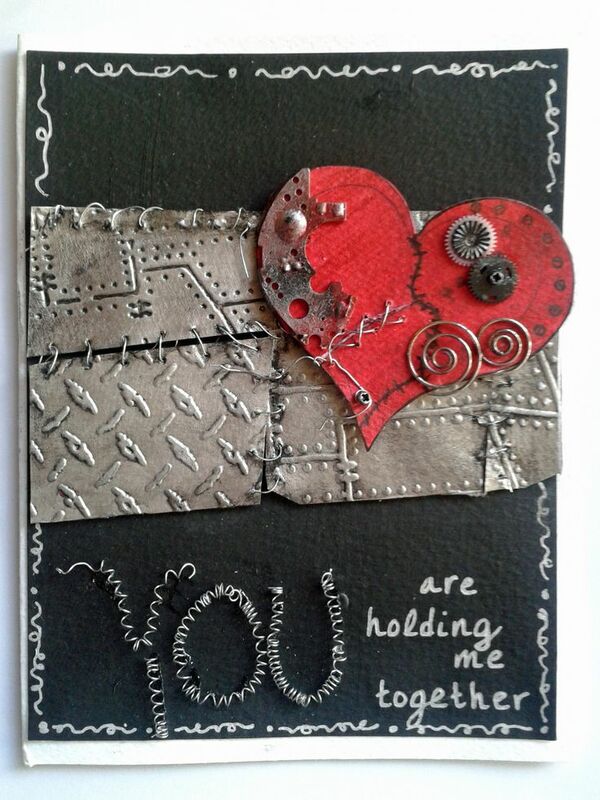 I have been scrapbooking and card making for over 15 years. Like many of you, scrapbooking is a big part of my life and I do it almost every day. no I do not think so I find everything beautiful, mixed media steampunk vintage and romantic layouts and I like to use a lot of flowers on my layout. Thank you, Tina, for being with us and for creating such a wonderful steampunk bag for our Tic Tac Toe challenge! We are (impatiently *lol) looking forward to seeing your fab entries soon (with the2D and 3D collections below)!